Fit Momma of Four: 21 Day Fix, is this the new workout for you? If you are anything like me you set BIG goals for yourself at the beginning of the year. Some of those goals were short term, some will be achieved over the span of the year. Some of my goals were about family, some about personal development, some concerning the growth of my business, but one of the BIGGEST goals I set for myself was about the number of individuals & families I wanted to help to reach their HEALTH & FITNESS GOALS in 2014. 100...I want to help AT LEAST 100 individuals & families learn how to live healthier lifestyles through clean eating & exercise. Today Beachbody has given me an AMAZING new tool to help reach more people & build that foundation of healthy habits. The 21 Day Fix is a program that focuses on proper nutrition & portion control paired with 30 minute daily workouts to help anyone looking to improve their health & fitness! *Do you have a special event or trip coming up that you would like to drop a few pounds before attending? Test groups of the 21 Day Fix have shown that in just one round with this programs folks have lost as much as 10-15 lbs. in just 21 days! *Do you have 50-100 pounds or more to lose? Beachbody ran multiple test groups with individuals with every body type & fitness level out there. In several groups they used the 21 Day Fix program multiple times back to back & lost upwards of 100lbs. in 11 rounds of the 21 Day Fix. *Are you looking to kick-start a healthy lifestyle of clean eating & learn how to properly fuel your body? 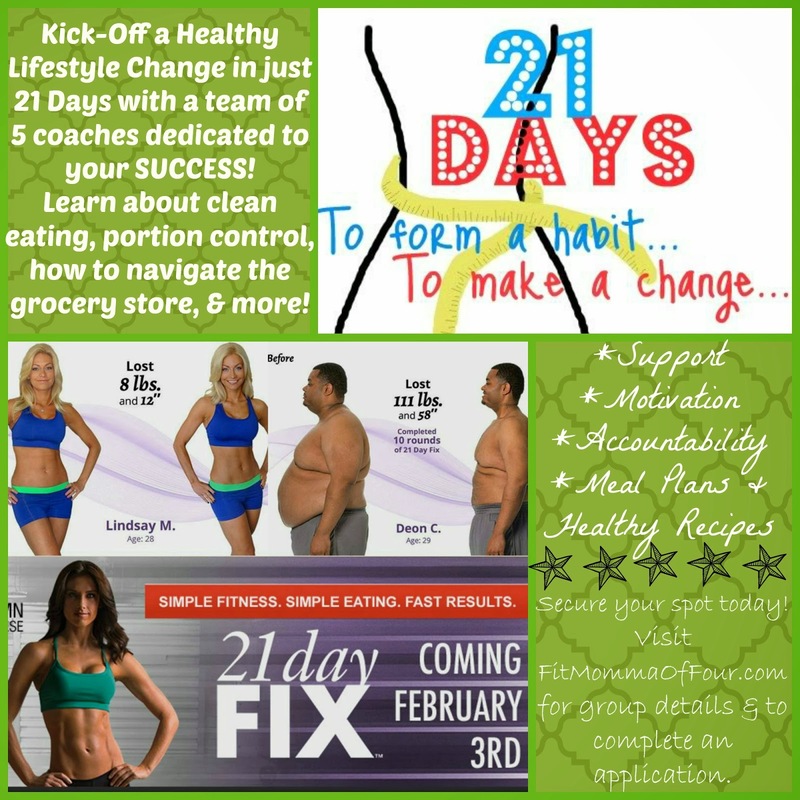 The 21 Day Fix was developed by Autumn Calabrese, a personal trainer & bikini competition participant. Through her years of work as a trainer & fitness competitor Autumn found that nutrition was the KEY to getting the results that you want! She developed this program's nutritional plan to focus on clean eating & PROPER PORTION CONTROL! The 21 Day Fix even comes with color-coded containers to help you STOP over-eating & learn how to fuel your body in the healthiest way possible. *Are you a BUSY individual who doesn't have time to drive to the gym or do hour long workouts? Every workout in the 21 Day Fix is ONLY 30 MINUTES long! You workout 7 days a week for 21 days for AMAZING SUCCESS. Fitness, nutrition, coach support...it's a winning combination! *Are you a self-proclaimed "gym rat" but you want to add something new to your routine & really focus on your nutrition? Adding a 30 minute workout to your routine is TOTALLY do-able! Color-coded containers to help you learn the PROPER PORTION to eat from each food group & an awesome nutrition guide with great new recipes to try. How can a challenge group benefit YOU? *In this challenge group you will receive personal support from me, your coach. You will get daily motivation, accountability, health & fitness tips, and access to a community of like-minded people whom are all striving to get fit & healthy for the new year. You will learn about clean eating & be provided with sample meal plans, clean eating recipes, tips for navigating the grocery store, how to eat clean on a budget, guidance on how to make healthier restaurant choices, & more! Ready to secure your spot in this challenge group? Follow this link to complete an application now!